The Montreal Expos remain a prominent team in the rich history of Canadian baseball. They were was once regarded as Canada’s team—from their first season in 1969 until the Toronto Blue Jays joined the MLB in 1977. The Expos left Montreal in 2004 for Washington, D.C. and significantly changed the way Montrealers viewed baseball for years to come. While the Expos still called Olympic Stadium home, Danny Gallagher was one of the people behind the team’s media coverage as a beat writer for the Montreal Daily News. Once the Expos became the Washington Nationals, he remained an active figure in the preservation of the team’s history. Gallagher has written five books about the Expos, including his most recent project Blue Monday: The Expos, The Dodgers and the Home Run That Changed Everything. Gallagher grew up in Douglas, Ont., and played adult baseball for the team, appropriately named the “Douglas Expos.” He began to see what having a competitive MLB team in Canada in the late 1970s did for the sport. When it was all but confirmed that the Expos would leave, Gallagher said Montreal entered a period of serious disinterest in the sport from 2004 to 2012. When Expos Hall of Fame catcher Gary Carter died in 2012, it brought attention to the team again. Gallagher credits Warren Cromartie, an Expos outfielder from 1974-83, for reigniting interest after Carter’s death. “[Cromartie] grabbed the bull by the horns,” Gallagher said. In 2012, Cromartie created the Montreal Baseball Project, a group aiming to bring a team back to Montreal, and held alumni events for the 1981 and 1994 Expos teams. The 1981 Expos were the only team in franchise history to make the playoffs, finishing in second place in the division, while the 1994 team had a league-best 74-40 record before the MLB shut down the rest of the season for a strike. “Without Cromartie, I don’t think that [a possible return of Montreal baseball] would be that significant,” Gallagher added. Gallagher covered the Expos when newspapers were still prominent. When asked if he thought that the way sports writers cover games has changed since his time, he had a simple answer. “I don’t think so.” However, he said the digital age has impacted sports journalism in some way. Despite an uncertainty of baseball returning to Montreal, Gallagher still maintains that Canadian baseball is going strong, and that is because of the Blue Jays remaining in Toronto. 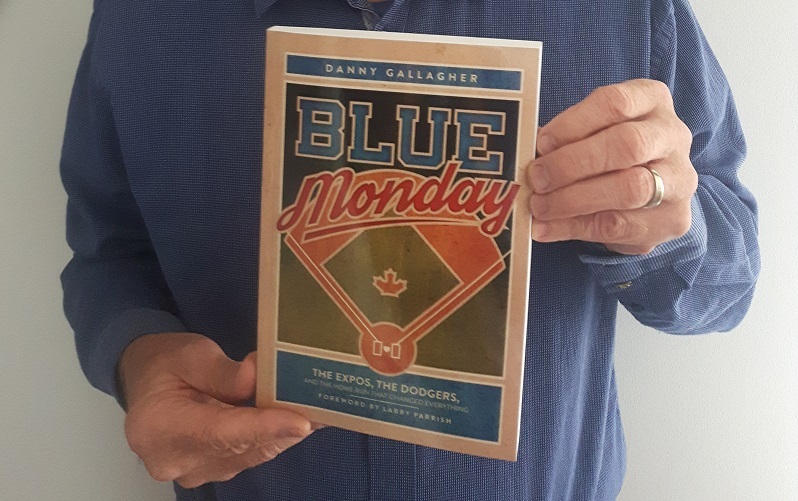 Danny Gallagher’s latest book, Blue Monday: The Expos, the Dodgers, and the Home Run That Changed Everything, hits stores on Oct. 13. Gallagher will be signing copies that day at McLean’s Pub, and at Indigo on St-Catherine St. the following day. Main photo courtesy of Danny Gallagher.